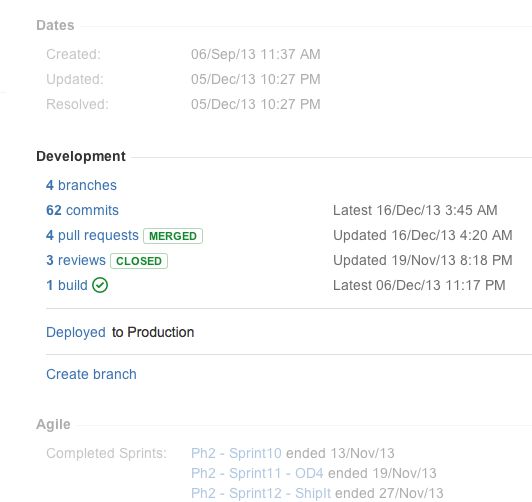 With supported versions of Bamboo and a Jira application, this information is collated within the Development Panel. This panel summarizes the status of all work related to an issue, and can assist in identifying where an issue's build is failing, and where it has been deployed. A manager can see if a bug has made it to production. Linking Jira applications and Bamboo has the benefit of improved information exchange during your development process. See Integrating Bamboo with Jira applications for information about permissions and configuration. at least one run failed for any build by any linked instance of Bamboo. A build is automatically linked to an issue if one of the build's commits includes the issue key in its commit message. The issue key must be included in the commit to activate this feature. A deployment to an environment, such as Production or testing, is linked to an issue if a commit associated with the deploy contains the issue key in its commit message. The Development panel details the environments that associated Bamboo builds have been deployed to. The issue key must be included in the commit to activate this feature. Note the 'Deployment Panel' is no longer displayed on an issue when the 'Development Panel' is available.